While Hurricane Nate took its toll on Dat School's attendance on the first day of the pilot program, we nevertheless persisted and had a great morning. With two students, we started our day out with the typical meetings associated with ALC schools. We set our intentions, made our schedule, and got to work. Using kanbans, or organizational boards, the kids plan out their activities. Columns on the kanbans are "ideas," "doing," and "done." They write, or draw, their idea on post-it notes and move them across the board as they work on their ideas. Today's schedule included building a secret hideout, learning to cook kale chips, and learning hip-hop/break dancing. 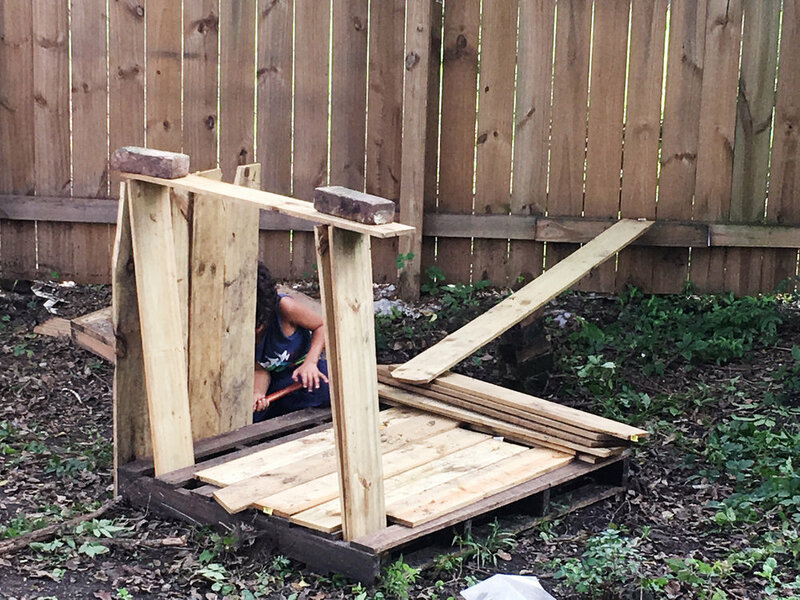 The kids decided that the secret hideout should be built in the backyard and that they would work on it for an hour. In that hour, they managed to build the floor and part of one wall. They also realized what hard work and planning it would take to complete it, but were not deterred. The kids are able to play and learn simultaneously as they work on their projects. They troubleshoot, problem solve, succeed, and sometimes fail. It's all valuable and all a learning experience. After the hideout, the kids played for a bit and had so much fun that they decided to forego learning how to cook kale chips. There was some really beautiful imagination going on in that room. To finish off the morning, we had a short hip-hop/break dancing lesson. We finished out the morning with a reflection meeting and talked about what we learned, what we liked, and what we wanted to do next week. The last few minutes of the day are spent reflecting on what we accomplished, and what we plan on doing next week.